Lying 200km to the north west of Madrid and 120km from the border with Portugal, the UNESCO World Heritage City of Salamanca is best known for its famous university which dates back to 1218. In its day it became one of the world’s principal seats of learning alongside Oxford, Paris and Bologna. Today it is a magnet for foreign language students learning Spanish who help make Salamanca the liveliest town in Old Castile. Whilst the city contains many ancient buildings in its historical centre, it’s the Plaza Mayor which serves as the main attraction for visitors and locals alike. You’ll find plenty tapas bars and Castilian restaurants around the square where you can ponder the hustle and bustle of daily life. Early evening is a particularly rewarding time to wander around as the setting sun seems to bring the ancient sandstone buildings to life. From spring through to autumn the weather in Salamanca is generally conducive to tourism but in spite of many beautiful clear skies during the winter months the city can be freezing cold. The 12th June marks the feast day of Saint John of Sahagún who is the patron saint of Salamanca. As well as the religious festivities associated with this event there are many typical Spanish fiestas around this date. The Feria de Salamanca takes place during the 2nd week of September and is a great time to visit the city when returning students join the locals to celebrate ‘La Virgen de la Vega’ which is the city’s biggest annual fiesta. In the absence of a nearby international airport, Madrid is the gateway to Salamanca. There are about 5 daily train services from Madrid’s Chamartin Station (check timetables at www.renfe.es) via Avila which take around 2 hours. The station is northeast of the city centre on Paseo de la Estación de Ferrocarril which is a 15 minute walk into town. Frequent services also operate from Valladolid. There are also many bus services from Madrid which take up to 3 hours. The bus station is to the north east of the centre on Avenida de Filiberto Villalobos which is again about a 15 minute hike. Avila, Valladolid, Leon and Caceres are also well connected by bus. If you’re arriving by road you take the A Coruña road out of Madrid then cross to Avila and on to Salamanca. The road then continues to Portugal. Use the map below for more details. A number of companies offer day trips by coach or private vehicle but you’ll spend a good part of the day travelling so I’d strongly recommend that you plan on at least an overnight in the city if you have time and wish to do it justice. If you’re travelling on to Portugal or to Santiago de Compostela the city is a logical stopping off point. A couple of other places that are well worth a visit if you’re in this part of the world are Avila and Ciudad Rodrigo. If time is of the essence and you can’t afford an overnight then you can take a full day private tour which includes an English speaking driver and official tour guide who will take you on a walking tour of the main sights including the New and Old Cathedral, the University area, the Plaza Mayor and St Stephen’s Monastery. Whilst the Plaza Mayor and the various Salamanca University buildings are the best known attractions there are plenty more interesting sights to keep you busy. The city has not one but two Cathedrals with the entrance to the old one lying inside the new one. This serves the dual purpose of confusing tourists and amusing the local clergy who can have a laugh at them. By the way the “new” cathedral dates back to 1513 and took over 200 years to build, it is one of the great cathedrals of Spain. Other things to see include ‘La Casa de las Conchas’ which is a house decorated with 350 shells, a fine Roman bridge and a variety of ancient Renaissance buildings scattered around the historical central district. All the city’s main attractions can be reached comfortably on foot so there is no need for public transport. Plaza Mayor: As already mentioned, this beautiful 18th-century baroque square is right in the heart of the historical centre of Salamanca. It was the venue for bullfights well into the 19th century. It is particularly stunning at night when it is illuminated. 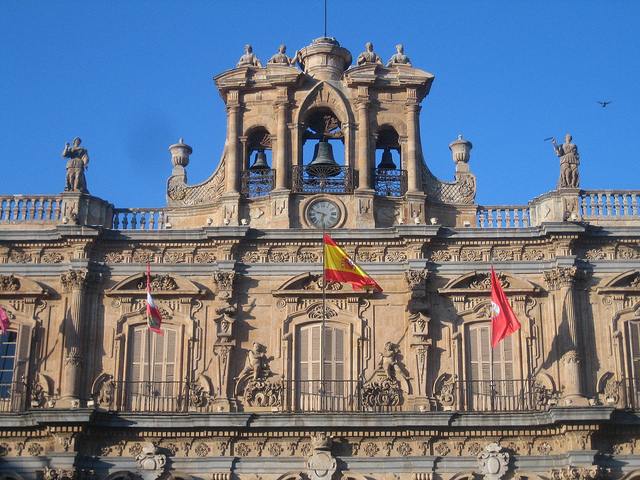 Salamanca University: The entrance to the university has a stunning facade containing an array of heraldry, historical figures including the busts of the Catholic Monarchs and a frog! It is said that if you spot the frog without help you’ll have good luck and will get married within a year. Salamanca is the oldest university in Spain and was once on a par with Oxford, Paris and Bologna as a place of learning. Today it isn’t amongst the best of Spanish universities but is more important as a place for learning Spanish. This business attracts some 30,000 (mainly American) students every year. 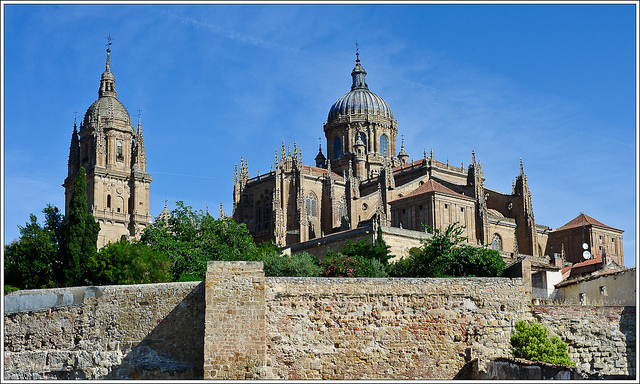 The Two Cathedrals: Salamanca has two Cathedrals built next to one another. The New Cathedral dates back to 1513 and took over 200 years to complete hence the display of late Gothic, Baroque and Plateresque (early Renaissance) features within its architecture. Its tower dominates the old centre of the city and you’ll be able to see its dome from almost anywhere in the city. Building of The Old Cathedral began in 1140 and is architecturally very plain alongside the flamboyant and much larger new version. Most of the cloister was destroyed during the Lisbon eartquake of 1755 but is still worth a visit to see its Gothic tombs and ancient organ. The House of Shells: The Casa de las Conchas (House of Shells) is Salamanca’s most photographed building. It was the home of a university professor who was a member of the Order of Santiago. He decorated the building with 350 scallop shells (the symbol of Santiago) as a monument to Santiago de Compostela. The Roman Bridge: Salamanca’s Roman bridge over the River Tormes dates back to 89 AD. It was an important part of the ‘Ruta de Plata’, the Roman silver route which ran from Mérida to Astorga. Salamanca’s Convent Buildings: You’ll come across many old convents and former university buildings as you wander the streets of Salamanca. One of particular note is the Convento de San Esteban (Convent of St Stephen) which is well worth a visit to admire the huge stone altar which is one of the city’s most impressive religious sights. In addition, the Convento de las Dueñas is a popular attraction where the nuns sell traditional pastries to tourists. Its 16th cloister is the city’s most impressive. For accommodation there is a good selection of hotels within easy reach of the Plaza Mayor so for many visitors they are rarely more than a few minutes from the square throughout their stay. If you’re driving you might prefer one on the outskirts where parking is more accessible. Some of Spain’s finest hotels are known as ‘paradors’ which are often housed in ancient buildings. This hotel is actually a modern structure standing on a small hill opposite the city. It’s in a perfect location for exploring the city’s historic centre and has a nice swimming pool for when you’re done with sightseeing. Its impressive restaurant serves up a fine selection of specialities from the region including some great roast meats. Well located in the heart of historic Salamanca, this hotel is housed in the ancient Convent of San Esteban. It combines the style of former times with the luxury, comfort and service of a modern hotel. Perfectly located within a 10 minute walk of the Plaza Mayor and other sites of the historical centre, this friendly little hotel is a quiet and pleasant place to stay in Salamanca. This new hotel located next to the Colegio de Fonseca is just a short stroll from the Plaza Mayor with great views over the Cathedral and University. The interior is all new whilst the exterior blends in perfectly with the surrounding buildings. This is a modern, comfortable hotel with excellent views across to the old city. It’s about a 15 minute walk via the Roman Bridge to the centre though this is very pleasant, especially when the city’s monuments are illuminated. Situated in a residential area 4km from the centre of Salamanca this is a particularly good choice if you’re driving. It is well equipped with swimming pools, tennis courts, basketball nets and spacious gardens. Another good choice for drivers as it lies on the outskirts of the city with plenty free car parking space. It is within walking distance of the historical centre and in summer has an outdoor swimming pool. Good value hotel on the outskirts of the city next to the N-630 Avila-Madrid road. Ideal for drivers intent on avoiding the hassle of the city. It has an excellent restaurant, a garden with children’s playground and a gym with sauna. Located in the heart of Salamanca in a magnificent building which looks through its balconies onto the splendid Plaza Mayor in the heart of the historical centre. Comfortable rooms with all modern facilities. Salamanca University was founded in 1218 by Alfonso IX and soon became Spain’s most important university. Internationally its reputation grew rapidly such that within 30 years Pope Alexander IV proclaimed it equal to Oxford, Paris and Bologna, the greatest universities of the day and theories formulated here were later accepted as fact throughout Europe. Its most important contributions were to the development of international law and the astronomy faculty provided guidance to Columbus in anticipation of his forthcoming voyages of discovery. Under the Catholic Monarchs the University continued to flourish and it was a woman professor, Beatriz de Galindo, who tutored Queen Isabel in Latin. In the sixteenth century it was powerful enough to resist the orthodoxy of Felipe II’s Inquisition but freedom of thought was finally stifled by the extreme clericalism of the seventeenth and eighteenth centuries. During these dark times books were banned for being a threat to the Catholic faith, and mathematics and medicine disappeared from the curriculum. Under the Peninsular War the decline seemed complete when the French demolished 20 of the 25 colleges and by the end of the nineteenth century there were no more than 300 students at Salamanca University. Nowadays the University is not prestigious as an academic institution ranking well behind those in Madrid, Barcelona and Seville but it is very important as a Spanish language centre and some 30,000 students per year learn Spanish in Salamanca, many of them from the USA. As you enter the entrance to Salamanca University (Universidad Civil) you’ll see the enormous facade dominated by the Catholic Monarchs in the centre and all kinds of floral designs and heraldry around them. It is said that if you can spot the frog without any help you’ll enjoy good luck and will marry within a year (many visitors look well away when they hear this final detail!). I doubt if it applies to frog spotting here on your PC screen. But who knows? Let us know! There he is sitting on top of a scull in this close up. If you’re looking for more nonsense in Salamanca go to the New Cathedral and find Puerta de Ramos (the Frog Gate). Recent work by stonemasons include an ice cream cone and an astronaut which we assume weren’t there when the “New” Cathedral was built in the 16th Century! Please use the link to don Quijote to request an Infopack. Salamanca’s restaurants aren’t easy to find. It’s not the kind of city where you wander around looking at the different restaurants before deciding where to dine. We’ve tried this on our visits there and usually end up in a small tapas bar or a café serving platos combinados (basic pork, egg and chips type meals). On Plaza Mayor you’ll find plenty bars and cafés serving tapas type fare (try Mesón Cervantes at Plaza Mayor, 15) and there are plenty cheaper options on the adjoining streets of c/Mendez and Rua Mayor. Located in the historical centre, this is reputedly the top restaurant in town. It is the only Salamanca restaurant that has earned a Michelin star thanks to the owner/chef’s culinary experience in France. The fish and pork dishes tend to be the most popular and the style mixes classic French cooking adapted for Spanish clientele. If you’re looking for traditional fare then this long standing favourite just off Plaza Mayor is the one to choose. It is set in an old tavern serving up typical Castilian meat dishes including the excellent roast suckling pig. Just off Plaza Mayor this is the place to go for alternative Castilian cooking. Instead of the traditional slabs of meat you’ll find the same local ingredients mixed with unlikely companions such as partridge cooked in chocolate with cabbage. Interesting! This small basement restaurant with an open fireplace serves simple meat and fish dishes and has long been a favourite with the locals. This is Salamanca’s most stylish restaurant which is housed in the grand Palacio de Castellanos. A good selection of fish and meat dishes.